the light box to switch #1, and from the light box to switch #2. Again, in this case, a larger than normal device box is required at the light, due to box fill calculations (most regular size octagon boxes will only accommodate seven wires; in this situation, you will have eight wires). NOTE: This diagram is a thumbnail. To view it in full size – click on the diagram. NOTE: The white wires that are being used as hot conductors need to be identified as such by the use of black tape or coloring a section of the wire near the splice with a black felt marker to indicate that it is not a neutral in this particular situation. 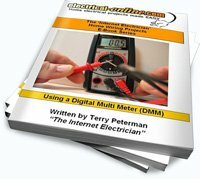 This entry was posted in Indoor Wiring Diagrams and tagged 3-way switch, 3-way switch variations, diagram, do-it-yourself, electrical projects, house wiring, light box, outlet, wire, wires, wiring, wiring a 3-way switch, wiring diagram, wiring project. Bookmark the permalink.